Why hike to McGurk Meadow? For literary historians who believe that the Kingdom of Oz is a thinly veiled version of Yosemite, McGurk Meadow holds one of the six key pillars of evidence: the Munchkins's cabin. For everyone else, McGurk Meadow is found money, the sprinkles on the ice cream, the Irish in the coffee: it's a bonus hike you can knock off whenever you have a free hour or two, an unheralded lagniappe that makes you feel like you've gotten the extra mileage out of Yosemite. It's a sun-dappled stroll through the woods to a wildflower-filled, brook-running-through-it meadow, over a smooth trail that doesn't require lots of concentration and allows your mind to go wandering where it will. Difficulty: A solid 1 out of 10. There's a slight incline on the return trip, but you'll find little else to complain about. This is one of Yosemite's most leisurely strolls. Best Time to Visit: The Glacier Point Road is open from June through October, roughly. The meadow is interesting anytime, but it's hard to beat June and July, when you're most likely to find a green meadow accompanied by dozens of varieties of wildflower in bloom and a full brook. Crowd Factor: Generally low. As evidenced by the lack of a parking lot for this trailhead, which also serves Dewey Point, Stanford Point, Crocker Point, and Westfall Meadow, this is still a largely undiscovered trail. Nearest Bathrooms: There's a pit toilet at Summit Meadow, just over a mile west. The nearest plumbing is at Chinquapin (the Glacier Point Road/Highway 41 junction), 7.5 miles (12 km) west. Nearest Snacks: At the Glacier Point cafeteria/gift shop, 8 miles (13 km) east. Getting There: If you're in Yosemite Valley, take highway 41 south for nine miles (14.5 km) to the Glacier Point Road. From Yosemite's southern entrance, take highway 41 north for 17 miles (28 km) to the Glacier Point turnoff. The turnoff is well marked, and it's the only eastbound road for several miles in either direction. From Glacier Point Road, travel east for 7.5 miles (12 km) to the trailhead. There's no parking lot here; watch for the "McGurk Meadow" sign on the north (left) side of the road. It's about a mile past Summit Meadow, which will be on your right and have a broad pullout with an outhouse. If you get to the Bridalveil Creek Campground, you've gone just past it. Here's a Google Street View panorama of the trailhead area. Parking: There's no formal parking lot at the trailhead. About a hundred meters downhill (east), you'll find a section of wide shoulder where ten or so cars can park; with any luck, there'll only be nine there when you arrive. 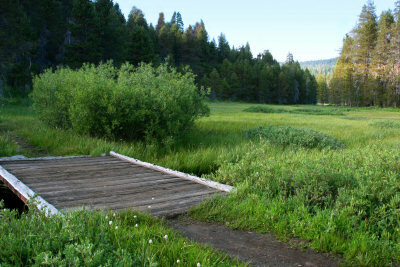 Hazards & Trail Notes: As with just about any meadow in Yosemite, if it's wet enough that the meadow is still green, you'll want mosquito repellent. Already been to McGurk Meadow? Add a Review.